It is a common thought that warm dresses are very simple and not stylish, that is why modern women and young girls are not prefer to wear warm outfits in cool days of winter, Most of young girls and working women are wrap shawls and dupatta on their shoulder but the shawls can't warm their whole body.Our today's collection change your thought regarding the warm dresses. She-styles have brought warm and modish winter dresses collection 2013. This collection is associated by Warda Designer Collection. This is a winter collection 2013 and warda inaugurate a good sense of stylish khaddar and linen winter dresses. These warda winter dresses 2013 are mind-blowing and its includes chiffon dupatta, khaddar shirts and linen shirts with trousers and shalwar. 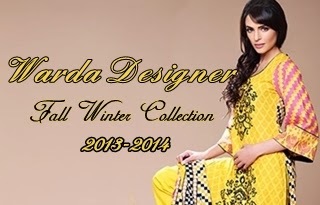 Warda Designer Winter Collection are entirely adorned with embroidery and glowing prints. It is first winter collection 2013 which is modernly stitched. Designer and tailors are used quite modernity stitching techniques in this collection. You will find out numerous long shirts designs like embroidered khaddar shirts, linen printed shirts, front open shirts designs, double shirts, two pocket shirt, U shape shirt( round daaman kameez) and strip design shirts.